The human studies included in this analysis showed greater homogeneity in the methodology than the animal studies [19, 20, 21, 22, 23, 24]. Therefore, we performed a meta-analysis on these six selected human clinical studies. Of all these six human studies, only one study investigated soft tissue healing potential of simvastatin. All these clinical trials aimed to determine if simvastatin intervention could benefit surgical approaches and improve clinical and radiological parameters. The dosage of simvastatin used in all studies was 1.2 mg except in the study by Gouda et al. in 2017 . In this study, the researchers conducted a split-mouth study comparing 0.1 mg of simvastatin/14 mg of beta-TCP to beta-TCP in maxillary sinus lifts. Although this study included the least number of patients among all the selected studies in this review, it exhibited the strength in extending the follow-up to 9 months after the surgeries. Three human studies assessed the changes in CAL (Fig. 2a) and PD (Fig. 2b) in periodontal defects [19, 20, 21]. 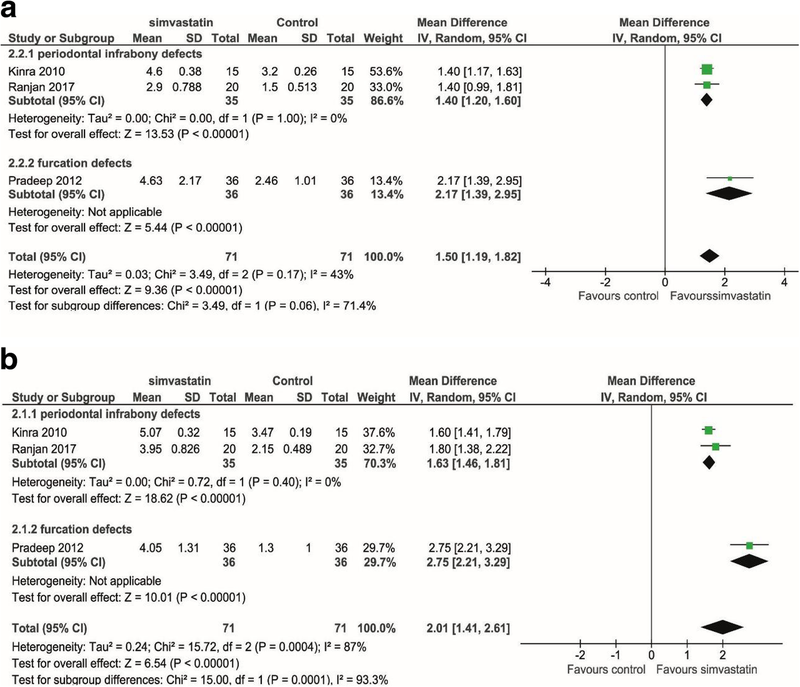 There was evidence of a significant benefit of simvastatin for both CAL gain (mean difference 1.50 mm, p < 0.001, 95% CI = 1.19, 1.82 mm) and PD reduction (mean difference 2.01 mm, p < 0.001, 95% CI = 1.41, 2.61 mm). All the studies favored the statin-treated group. The study by Gouda et al. also showed a significant positive effect of statin on bone height improvement in the maxillary sinus augmentation. 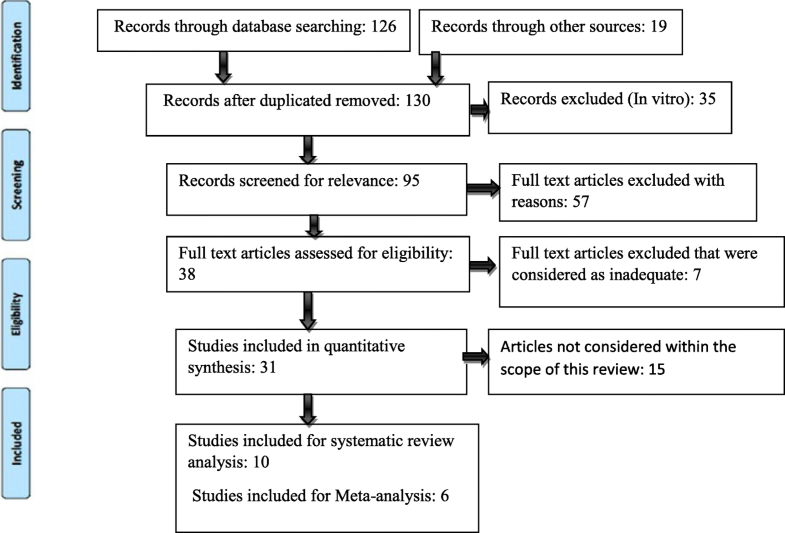 But we did not perform a meta-analysis on these topics because it is the only study on such procedure. 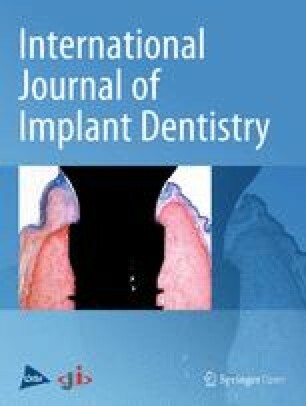 Four animal studies investigated the changes in bone fill after dental treatment with the use of simvastatin [14, 15, 16, 18]. Among these studies, one study was conducted on dehiscence , one on fenestration defects , one study was on tooth extraction defects , and one on distraction osteogenesis . Except for the study on fenestration, all the other studies showed a positive effect of simvastatin, although no statistical significance was reached in two studies [16, 18]. Due to heterogeneity in the protocols and outcome measures, no meta-analysis could be performed to summarize the results of these studies. Three human studies assessed the changes in the width of alveolar ridge evaluating bone fill radiographically [19, 20, 21]; we found the significant improvement of alveolar ridge width in the simvastatin group than its control group (mean difference = 1.40 mm, p < 0.001, CI = 0.99, 1.81 mm) (Fig. 3). Five animal studies investigated whether simvastatin application alters bone mineral density (BMD) [11, 12, 13, 17, 18]. Vaziri et al. in 2007 measured bone matrix resorption in ovariectomized rats using a dental X-ray unit, and giving densitometric measurement values in mm . Anbinder et al. in 2007 measured BMD in ovariectomized rats with a digital dental X-ray unit, giving optical density values in gray levels . Wu et al. in 2008 measured BMD with dual-energy X-ray absorptiometry (DXA) and provided the results in the unit of mg/cm2 . Kilic et al. in 2008 measured BMD changes in rabbits by peripheral quantitative computed tomography (pQCT) and represented the results in a Hounsfield scale . Ozec et al. in 2007 were excluded from the final analysis because this study did not provide sufficient data . These four studies all showed the mild positive effect of simvastatin on BMD, but without the statistical difference. Due to the methodological differences, it was not feasible for us to aggregate the results of BMD changes using a meta-analysis. Simvastatin is a lipophilic drug. Hence, to increase its absorption at the local sites and to delay the release of drug thereby achieving a sustained release, simvastatin is usually mixed with carriers like ethanol, chloroform, and methanol , or mixed it with bone graft materials such as DFDBA and beta-TCP [19, 23]. Nyan et al. in 2009 and other research explained the burst release phenomenon of simvastatin from the graft particles on the first day followed by slow release. This is advantageous as the optimal dose of the drug stimulates local cells to express BMP-2 without inducing the inflammatory reaction [33, 34, 35, 36]. Another reason to use carriers is for space maintenance, for which thermosensitive materials are usually considered. These materials change their form from liquid to semi-solid, which aids in retaining the drug at a specific site for a longer duration of time. Hence, one of the aims in the present systematic review was directed at determining the outcomes after the administration of simvastatin with and without a carrier. Studies by Sherif et al., Holwegner et al., and George et al. [14, 37, 38] reported no statistically significant differences in their results between the two groups. Rutledge et al. and Ozec et al. [16, 17] have used gel foam and collagen sponges as carriers with simvastatin to determine, if any advantage was obtained, with the use of respective compounds. Rutledge et al. in his study reported that the use of ethanol prevents the backflow of the drug compared to carriers like methylcellulose due to their thermosensitive property. Also, in the same study, they compared the effects of simvastatin on bone formation with or without the adjunctive use of bone grafts. Though they observed a significant difference in the bone formation between the two groups, the results were not statistically significant. Sherif et al. in his paper further commented that there is no definite consensus on the indications for the use of carriers and it is determined by the type of surgical procedure.